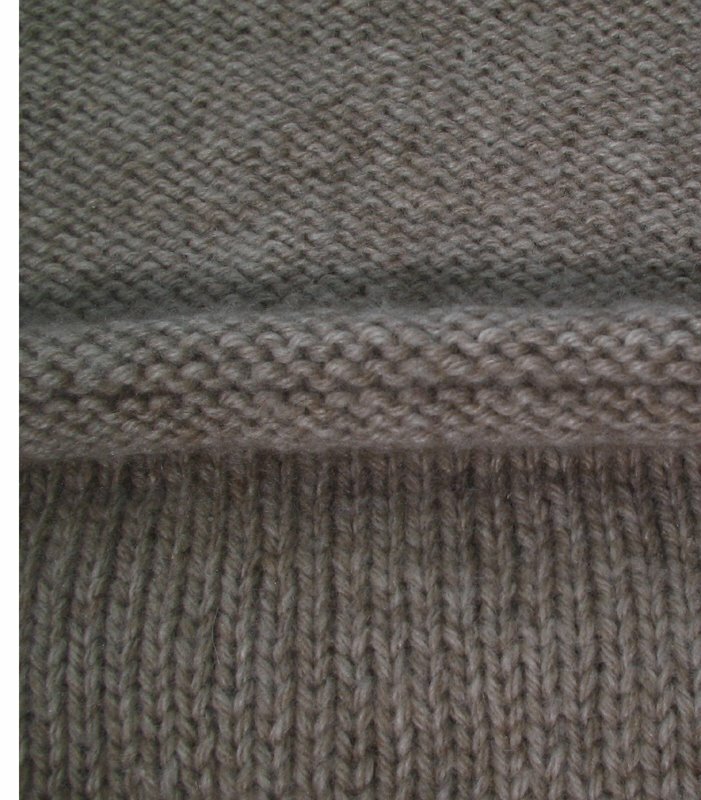 I have tossed all other projects aside in favour of my Knitting Nature cashmere obsession. 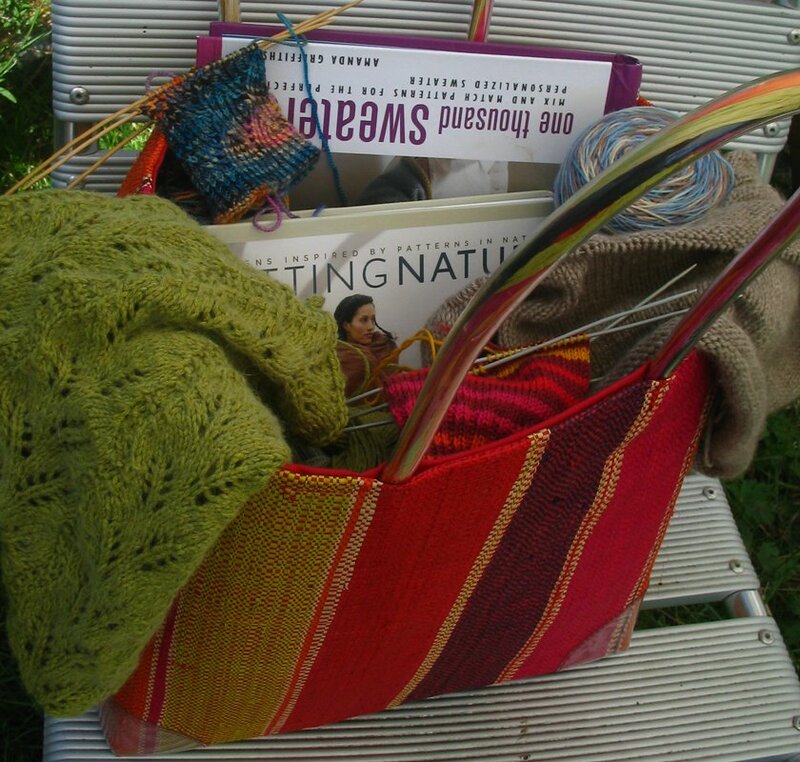 Not the best summer knitting project, but what can you do? The yarn is so soft, and knits up beautifully, very evenly. I love the sandy colour, and I hadn't noticed before but it's sligthly heathered, not much but enough to make it interesting. I tried to take a close up to show it. I made a few false starts, with all combinations of 2 sizes and 4 needles. Eventually I settled for petite (haha) with the smallest needles (4 mm - double hahaha). But according to the swatch it would be ok. I knitted 5 cm and checked my gauge. Not ok. The calculator told me that the 36 inch garment I hoped would fit my 38 inch chest was actually going to be 31 inches. Gaahhh!! To the frogpond - again! I don't know why, but I decided to take it of the needle and try it on anyway, and what do you know?! It fits just fine - both chest and hips - it all looked fine. Im amazed. I have no explanation for this. 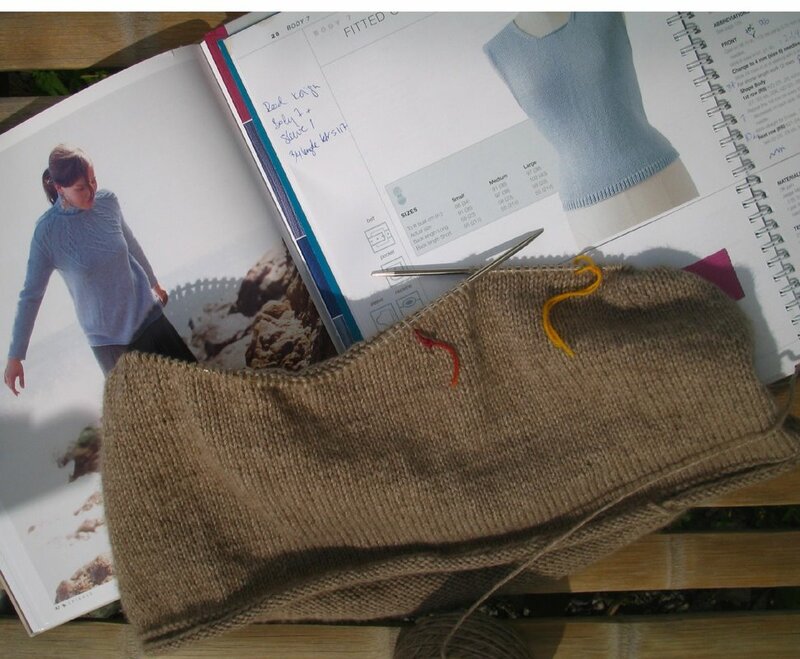 I am going to knit the cabled yoke exactly according to the pattern,but for the body I am making some modifications. Well, actually I'm using a completely different pattern, namely a fitted sweater pattern (number 7) from 1000 Sweaters by Amanda Griffiths, but with a hemmed edge instead of ribbing. 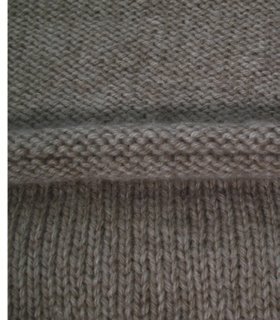 Both sweaters are visible in the top photo. The third photo is my knitting bag ready for a five weeks vacation starting tomorrow. The contents are Julia, Cabled Spiral Sweater, the start of a pomatomus sock, the start of a Regia sock I think of as A Very Seventies Sock, and two skeins of Lornas Shepherd Sock in the Sandy Ridge colourway in case of really nice weather (meaning too hot for sweater knitting, but that's not very likely!). We're going to Denmark for a child oriented trip this week, but I have of course made some research into yarn shops I would like to check out. But there probably won't be time. After that we'll spend some weeks, first on the Norwegian South Coast ,and later nearby Ryfylke, where I don't have internet access. But I'll be going a bit back and forth, so I think I'll be able to update my blog once in awhile and check my mail too. But I will not have enough internet time to keep up to date on my bloglines subscriptions, so if you think I should have commented, please forgive me now! I have to go and pack the rest of my things now, but if I have time later tonight, I'll try to post the pattern for the Daisies Socks that someone asked about. Yes please to the sock pattern. Have a fantastic time away! I know a lovely yarn store in Copenhagen and also a fabulous boutique that sells handmade items, mostly for children, including knitted items also in Copenhagen. I'd be happy to forward you the info.